The wedding season in the celebrity world doesn’t seem to end this year. 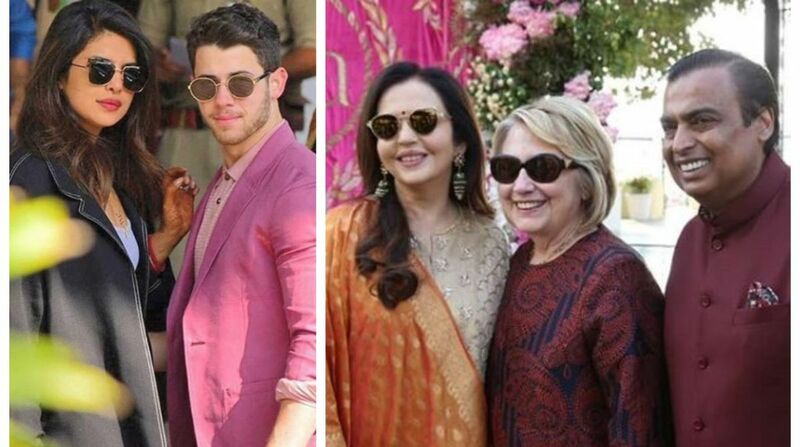 After Deepika Padukone-Ranveer Singh’s Italy wedding, and Priyanka Chopra-Nick Jonas’s Jodhpur wedding, the celebs are now gearing for another big Indian fat wedding. Since Saturday morning, the Udaipur airport had been witnessing a deluge B-town celebrities. From Aishwarya Rai Bachchan-Abhishek Bachchan, Priyanka Chopra-Nick Jonas, Salman Khan, Katrina Kaif, Aamir Khan-Kiran Rao, to Karan Johar, Sakshi Dhoni with Ziva, all were spotted heading for the the gala. Apart from Bollywood stars, business leaders and politicians are also going to be part of the extravaganza. Former US First Lady Hillary Clinton arrived at Udaipur and posed with Mukesh and Nita Ambani in Saturday. Dressed in a red kurta and black pants, she stepped out of the airport and left for the venue. Mrs Nita & Mr Mukesh Ambani receiving Former First Lady of US Ms Hillary Clinton, who arrived at Udaipur for the pre-wedding function of Isha Ambani and Anand Piramal. @sakshisingh_r with daughter #zivadhoni arrive in #udaipur to attend #ishaambani pre-wedding ceremony. The wedding celebrations of Isha Ambani kick-started with an Anna Seva performed on Friday night, where they fed nearly 5,000 people. The pre wedding functions will be held on 9th and 10th December followed by the wedding on 12th December. The wedding invite of Isha-Anand has started doing the rounds on internet. It’s a card placed inside a box with initials of the couple and has pages in the form of a diary. Seeking blessings from people, the family will serve food three times a day at the Narayan Seva Sansthan, Udaipur.